Happily, this week I only have one load of laundry. So aside from needing to dedicate my entire morning to monitoring it, all is good in laundry land. Also, I learned our new friends A & A do not have a dryer in their apartment basement so I have decided to be very grateful for shelling out my $15 CHF to do be able to wash and dry. Since I am mastering the art of laundry in Switzerland, it was time to move on….to dry cleaning. I had done some research on Glocals and found that the chains are best as a lot of clothes can disappear or get ruined in some of the Mom & Pop cleaners and there isn’t really any repercussion. You see, in Switzerland, there is no such thing as “the customer is always right”. Its really more like “get it our way”. In fact, I recently read that the one Burger King had closed down in Geneva. It is probably because the Swiss business owners revolted when they put up the slogan, “Have it your way”. They didn’t want it to become a trend and disrupt the system. I researched and found a chain that is near our temp apartment and also has a branch near our permanent one. So, I brought in four of Gabe’s work shirts. “Parlez-vous Anglais?” I asked the cashier. 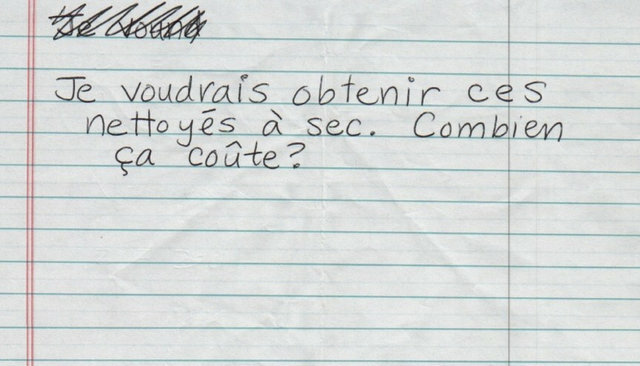 However, it’s okay….I whipped out my homemade note (thanks Google Translate), and showed her. She started punching in numbers on the register and $68.10CHF appeared. I frowned. “Non?” and pointed to the special price….only 4.50 CHF ($6 USD) for a man’s shirt. She agreed, “Non…” and then came up 22.80 CHF. She replied, “Lundi,” which means Monday. So, one week to get shirts back. Yikes, I hope we get access to our shipment soon as now four of Gabe’s shirts are locked down in Swiss dry cleaning jail! While my note worked this time, I’ll refrain from doing this at the UBS (the bank). I think they might not like my tactic so much there.